Our multi-disciplinary approach to design begins with a narrative that guides the macro and micro levels of the user experience. Storytelling engages visitors and allows them to form deep personal connections to our exhibits. The story is woven through each experience as exhibitry, graphics, videos, gaming or other interactive media in order to facilitate learning, wonder, and fun. Our dynamic and intuitive process involves intense collaboration amongst our diverse staff and our clients, exploring inspiration outside the industry, and drawing from our decades of design experience. Singular, imaginative results are the outcome of our approach and process, and something our repeat clients have come to depend on. How is a shark different from a sea turtle, or a manatee from live coral? From new habitat construction to rehabilitation, fresh water to salt water, Space Haus creates unique ecosystems that capture the character of the species that inhabits it, while catering to each animal’s critical and specific needs. 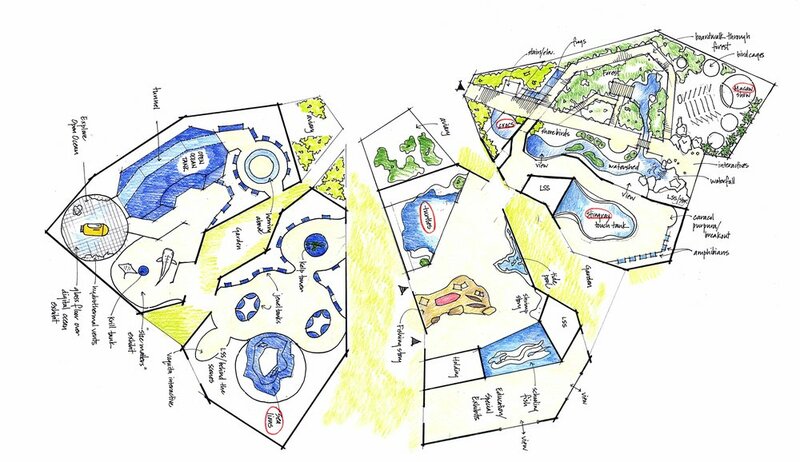 Understanding the unique biological systems of each animal and designing an appropriate habitat is a skill that Space Haus provides for each project. With decades of experience in water filtration design and operations, we can also size the necessary plumbing and piping systems and tailor the design to the given budget and space. Good design in healthcare environments can attract and retain patients by providing a carefully crafted experience within the context of a trusted brand. Space Haus provides a seamless integration of design, architecture, technology and artistry to create such experiences. In our healthcare work we look to nature as a source of inspiration, healing and respite. 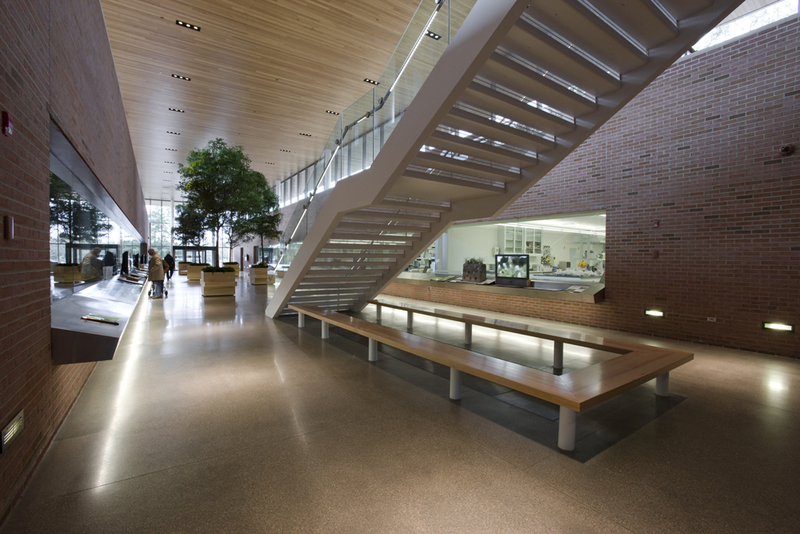 We have created projects that integrate nature directly, including live animals, rain gardens or nature murals. 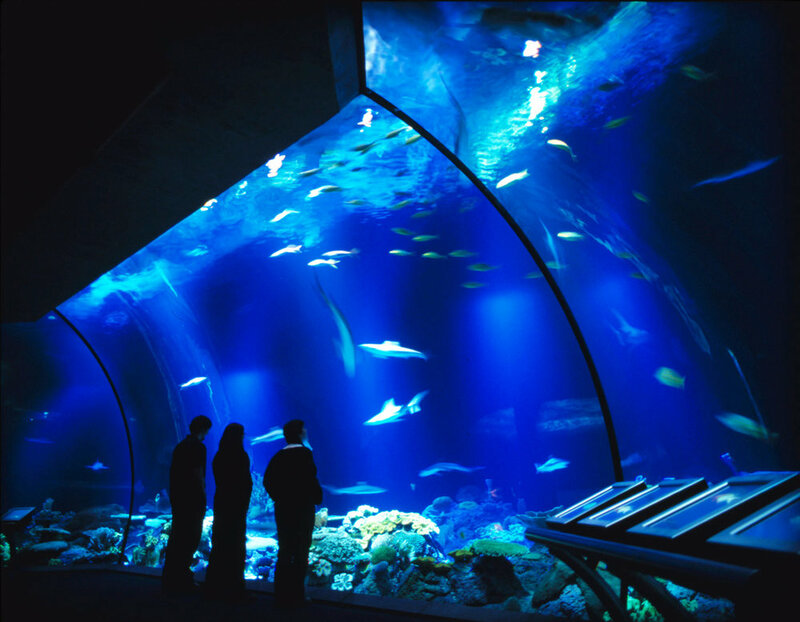 Our designers and engineers bring complementary skills to aquatic and animal exhibits, with experience ranging from residential aquariums to museum and zoo installations. Starting from a client’s budget and space, Space Haus takes a project from initial idea to final turnover. We can provide design drawings, design input on engineering drawings, installation services, troubleshooting and rehab of existing systems. Once the exhibit is installed, we are able to commission it, provide staff training, and prepare the operating guidelines manual to ensure optimal system performance. Quality installation of a Life Support System ensures the longevity of a healthy living environment. Whether your project requires a plumber or an engineer, Space Haus offers experienced staff that have successfully built aquatic environments up to 300,000 gallons. 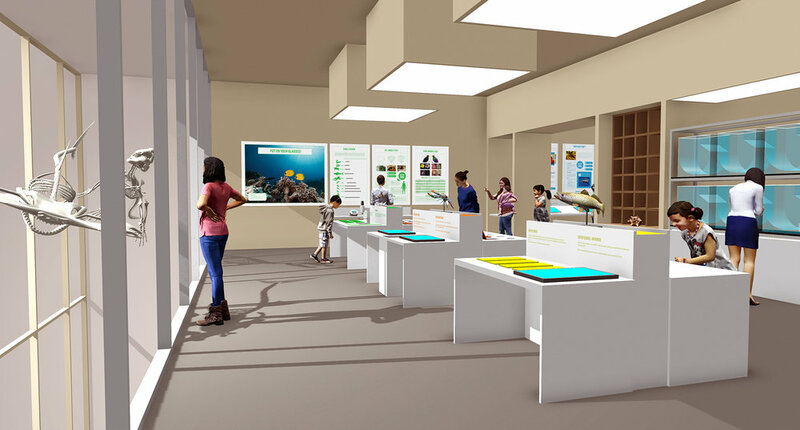 We offer architectural services as a complement to our exhibition design, master planning and aquarium design. Bringing a client’s vision to life often involves construction, technical capacity and the ability to draw and envision projects within a particular space with budget constraints and material preferences. Our additional skills include drafting, building code and zoning research, preparing measured site drawings, creating drawings for fabricators and contractors, to coordination with engineering consultants. Edwin Chung, while working for Booth Hansen, was Project Architect for the Chicago Botanic Garden Plant Science Center. Space Haus caters to artists and their unique art installation needs through specialized project management. With a diverse staff, we are capable of addressing a large range of ambitious projects, encouraging artists and cultural institutions to push the limits of what they previously thought possible. As a team and as individuals, we have consulted on special projects, developed custom solutions for clients and worked for internationally recognized artists, galleries, theatres and museums. In these instances we have helped produce, fabricate, manage, conceptually guide, and troubleshoot projects with varying ranges of complexity. Our team members are able to work efficiently with both local and long-distance artist clients to produce stunning results every time. Our master planning expertise will help you articulate your future goals for a building, campus or neighborhood, whether new or existing. We can fine-tune the building programming, do a feasibility study for a renovation or new construction, or evaluate your current space in terms of traffic flow, sustainability, or efficiency. Our experience in this arena includes small neighborhood plans, transportation studies, and institutional building master planning. Clients such as neighborhood development corporations and non-profit institutions have relied on us to help them determine the next steps for their institution. 2019 Space Haus LTD. All rights reserved. Sign up with your email address to receive the news.